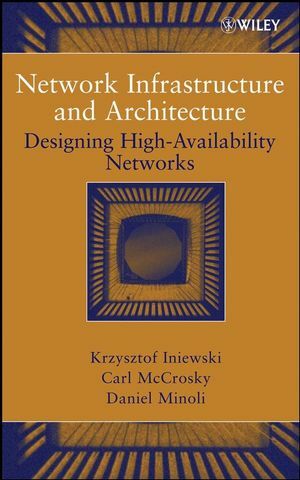 Network Infrastructure and Architecture: Designing High-Availability Networks takes a unique approach to the subject by covering the ideas underlying networks, the architecture of the network elements, and the implementation of these elements in optical and VLSI technologies. Additionally, it focuses on areas not widely covered in existing books: physical transport and switching, the process and technique of building networking hardware, and new technologies being deployed in the marketplace, such as Metro Wave Division Multiplexing (MWDM), Resilient Packet Rings (RPR), Optical Ethernet, and more. Complete with case studies, examples, and exercises throughout, the book is complemented with chapter goals, summaries, and lists of key points to aid readers in grasping the material presented. Network Infrastructure and Architecture offers professionals, advanced undergraduates, and graduate students a fresh view on high-speed networking from the physical layer perspective. Krzysztof Iniewski, PhD, is a founder and President of CMOS Emerging Technologies, Inc., a high-technology consulting company in Vancouver, Canada. Previously, Dr. Iniewski served as a university professor and R&D manager. He holds twenty-eight international patents and is a Senior Member of the IEEE. He is an editor of Wireless Technologies: Circuits, Systems, and Devices; VLSI Circuits: A System Perspective; and VLSI Circuits for Bio-Medical Applications. Carl McCrosky, PhD, is a Professor of Electrical and Computer Engineering at the University of Saskatchewan (Canada). Previously, Dr. McCrosky was principal engineer with PMC-Sierra, Inc., professor of computer science at the University of Saskatchewan, chief scientist of HyperCore, Inc., and a partner in Andyne Computing, Ltd.
Daniel Minoli has worked and published extensively in the technology field, with more than thirty years of hands-on experience in networking, IT, telecommunications, wireless, and video/IPTV. He has helped develop systems and solutions for such organizations as SES Americom, Prudential Securities, AT&T, Telcordia, New York University, Stevens Institute of Technology, and more. 8. Circuits for Optical-to-Electrical Conversion. 11. Packet and Cell Switching and Queuing. 13. Network Design: Efficient, Survivable Networks.